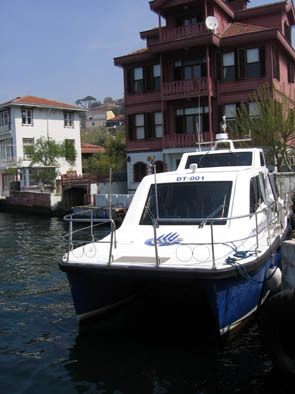 The ferry pier of Çengelköy doesn't get as much traffic as the public trasport hub ports of Kadıköy, Eminönü or Karaköy. 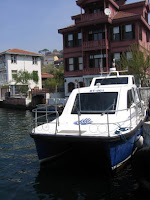 The morning I took the ferry to Emirgan there were only about fifteen other passangers besides me that hopped on board at Çengelköy. The route zig-zags from one side of the Bosphorus to the other stopping at the smaller piers unlike the bigger vapurs that plough between the main hubs. I think there are people on the boat that just come to enjoy the breeze and views. The morning of first of May in 2010. 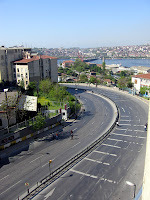 I sense that there is something wrong with the soundscape when I wake up in a room by the road uphill to Taksim square. 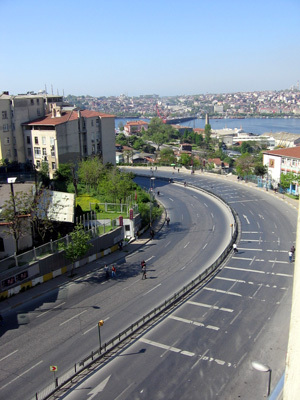 I look out the window and see what's wrong: no traffic. There isn't a single car or bus on the road. No rolling tyres, no murmur, no beeping, no accelerating, nothing. All roads to the square have been closed to traffic. 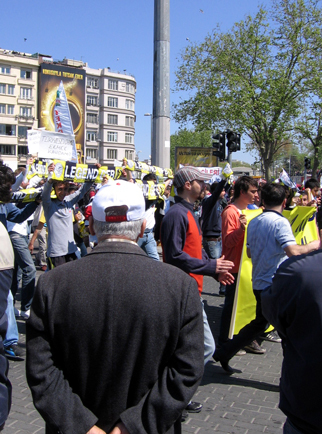 This is the first time the workers' unions are officially allowed to march and enter the Taksim square 30 years after the bloody massacre of 1977. Approximately 150 000 demonstrators and celebrators are expected. I turn on the TV, there's a live broadcast, a reporter among the marching crowds interviewing Cem Özer who was present also at the 1977 Labour day march. He stresses the importance of today's march: for whom he represents it is sacred. At the end of this recording I direct the microphone out of the window. Now there is the crowd on its way marching uphill to the square. When entering the square there is a van trying to make its way in the growing crowd. 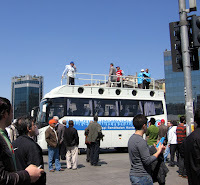 A man on the roof with a megaphone is telling the driver which way to go so and the people next by to give way. The sound of his voice is in sharp contrast with all the enthusiastic voices soon to be heard from the loudspeakers near the main stage. Not only audio though, acoustic sound sources were doing their best too. Here come the United Metal Workers with accompanying davul and zurna! After hours of speeches, singing, commemoration and politics the crowds slowly start to disperse. The police, with their tear gas, water cannons, tanks and all sorts of weaponery I don't even recognize, gaze upon the festive masses. 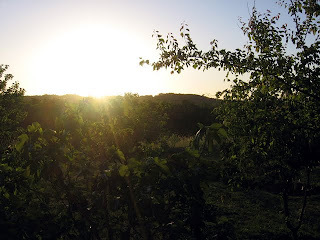 It was a warm summer evening in May. I'm standing on a porch of a friend of mine. She's having a picnic party at her country house north of Istanbul. Behind me is the house and behind that a crowd of 50 people singing türküs, playing baglamas, eating salads, pies and köftes and skipping rope. On this side of the house you can only hear the frogs. It's strange. As if I was in a different place alltogether. When I was a kid I remember there was much more stray dogs in Istanbul. Packs of quite intimidating, growling and often sick dogs. 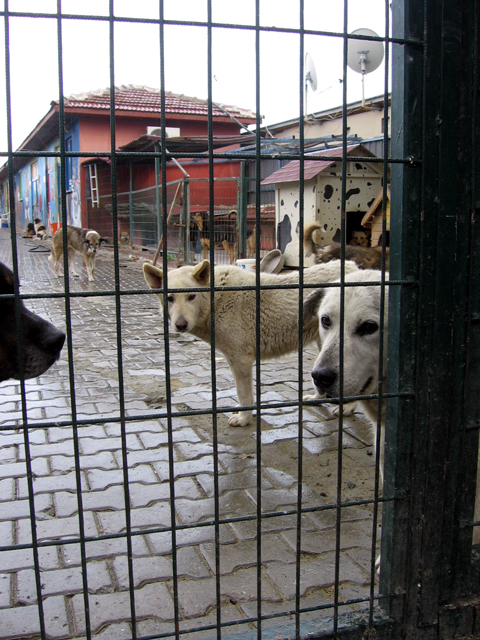 Nowadays there are new policies concerning strays and the situation is a bit better as they are vaccinated, neutered and tagged with electronic chips. The attitude towards dogs has also changed even though most are still afraid of them. 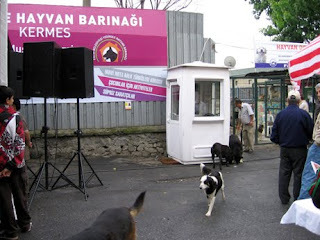 My friends' choir Mavi Nota attended a fundraiser at the Yedikule dog shelter for the abandoned, sick and wounded. The rainy day had gotten most of us wet and cold. The dogs (about two thousand of them) were some inside their dog houses, some mingling with the people in the crowd, some upset, some in a good mood. 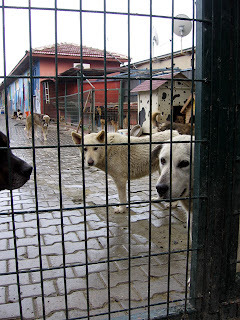 They were a sad sight but obivously doing much better than before arriving in the shelter. There was one with only three legs, she was one of the more jovial ones. Some children were trying to get their parents to adopt a puppy. Maybe a few found a new home during the day. The Hagia Eirene (or Aya İrini) church is located inside the Topkapı palace walls. It's a chilly April day. 1629 years ago the church was getting ready for the First Council of Constantinople. 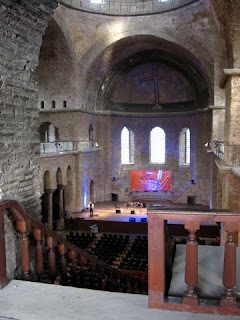 Now it is getting ready for the opening gala of the international poem festival "Şiirİstanbul". Chairs are being arranged, PAs checked, people building up the lights and testing them. One of the numbers during the evening is a reading of one poem Nazim Hikmet wrote to Taranta Babu in Rome 1935. To give the performance a bit more context there will be an audiotrack of Mussolini's "Vincere" speach in the beginning of the performance. The balance and timing needs to be sorted out. The vaults of the byzantine church echo with the transphonics of history. 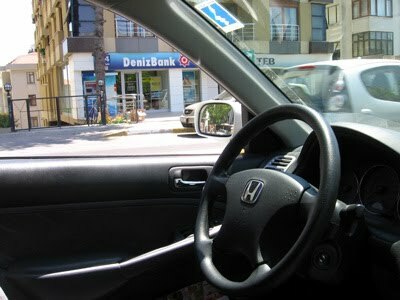 Last May I was counting traffic in Kuzguncuk. The method was to count everything passing me (people, cars, cats, bicycles ect) for 10 minutes on the hour, around the clock. 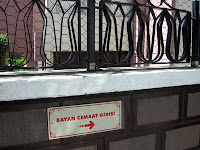 This was to demonstrate in an orderly fashion the changes in the everyday rhythms of the main street in Kuzguncuk. Who was on the move at the break of dawn, who at dusk, what was the time most kuzguncuklu come back home from work, when do the cats and dogs go about their business, how does the villagers flow in and out of Kuzguncuk and with which vehicles. Between the counting me and my friend who was acconpanying me on this lenghtly exercise sat down to the small square by the Bosphorus and drank tea. There were others too enjoying the warming evenings and Sunday calm, watching and listening to the black view dotted with lights and shades and the two rowing boats lulling on the waves. You can hear the waves splashing against the stone pavement and the distant hum of the cars crossing the Bosphorus bridge. 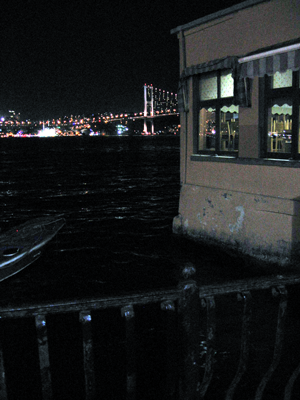 The building in the picture is the restaurant "Ismet baba", windows still closed (it was not that warm after all). last sunday I attended the celebrations of the 87th anniversary of Turkish Republic. the ceremonies were planned to be done in 29th -which is the official birthday of the republic- but because of the bad weather conditions the sunday morning was chosen. the event takes place every year in Vatan Caddesi, which is a large avenue- where the land cruisers can pass easily. the road was closed to the traffic, and police was everywhere. people weere waiting on the two sides of the road for the procession begins (it should start at 10:30). with a little delay the procession began, led by a military band playing anthems. troups of students from different schools, some civil clubs, the police, troups of soldiers, and finally land cruisers passed. meanwhile, the sounds of the anthems played by the military band, the voice of the soldiers accompanying them, the sounds of the land cruisers, the sound of the jets and helicopters flying over the people were mixing with the sounds of handclappings. what is interesting, this last part with the jets and helicopters was the most excitedly waited part of the procession by the participants. during the procession there was a moment when people began to chat about something that happened in Taksim, but no one knew what was it, and the police was refusing to answer the questions. 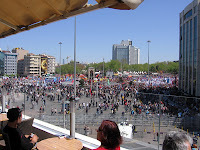 after the procession finished, people left the avenue without knowing anything about Taksim. 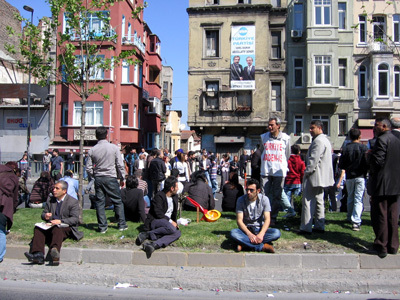 I called a friend to learn the details and learned that at the same time with the start of the procession a bomb exploded in the center of Taksim. 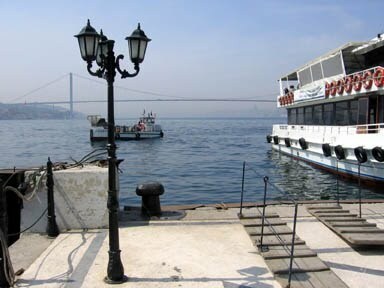 This is one of the most everyday soundscapes one can imagine in Istanbul, for me at least. Sitting in a car, waiting for something, anything, and listening to the traffic rolling by. Just when you thought there couldn't be anything interesting to hear at a shopping mall specialized in "home making"... how wrong I was! This is probably the most hilarious recording I've made during these weeks. At least I had fun while recording this, hopefully it transmits somehow. The recording starts outside the main door, from the parking lot. As I slowly walk into the gigantic hall and am being welcomed I encounter all kind of more or less bizarre sound events around me. 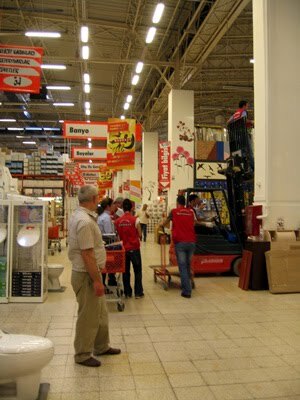 You can scent the fever of constructing and decorating with the people running around the wide corridors, looking up up along the huge shelves. 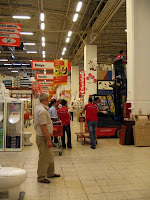 Forklifts, cardboard, cutting, hammering, announcements on loudspeakers and commercials on TV sets, all kinds of materials being handled, people evaluating everything around them. I had the opportunity to participate to a ceremony that was arranged 40 days after the funeral of a relative of a friend of mine. This prayer ceremony is called the kırkı, literally meaning the "40th". It started right after the midday prayer on a Sunday. 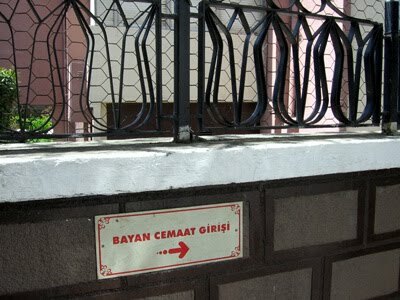 The voice of the imam is heard downstairs while the women enter the mosque from a small door at the back left of the building (the sign for it is seen in the picture). I cover my head with a scarf, take my shoes off and climb the wooden stairs to the second floor, haremlik, a mezzanine with a small latticed balcony from which the women folk can get a glimpse of what is happening under the main dome, selamlik, mens space. Some elderly women sit eyes closed at the balcony floor and are rocking themselves gently indicating religious concentration in listening to the imam after he starts the prayer with a strong melismatic voice. The loudspeaker is also turned on at the mezzanine after a while. It had been forgotten and was closed when I entered the haremlik. İstanbul'u dinlemeye hoşgeldiniz! 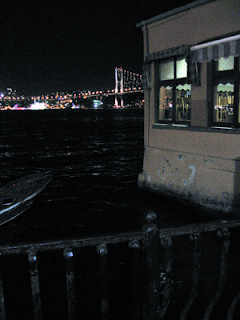 These are sonic musings and field recordings of two researchers of urban soundscapes, Meri Kytö and Şirin Özgün. The recordings by Meri Kytö are licensed under a Creative Commons Attribution-Noncommercial-Share Alike 1.0 Finland License.